The open support for liberal Democrat Bernie Sanders by Socialist Alternative provoked a debate within that group back in the first part of 2016. In response, the leadership of Socialist Alternative sent around an internal document defending their position. The authors of this open letter have received copies of Socialist Alternative’s Members Bulletins numbers 69 and 70. These documents reveal the existence of immense fissures caused by the leadership’s particular strategy around the Sanders campaign. In November of 2006, Socialist Alternative published a statement analyzing and giving warning to the Green Party, at the time fractured over a split on a Ralph Nader campaign. “From their beginnings up to the present, the Greens have been wracked by internal debates over their political program, their relationship to the Democrats, their internal structures, and their class orientation. Many of these questions came to a head in the 2004 race when deep divisions arose over whether they should endorse Ralph Nader or David Cobb as their presidential candidate. The Cobb wing supported a “safe states” strategy of not consistently challenging John Kerry to avoid enraging their friends in the liberal wing of the Democratic Party. They came out on top at the 2004 Green Party convention. However, probably half or more of Green Party activists supported Nader and his running mate Peter Camejo, who launched Greens for Democracy and Independence (GDI) after the convention. Many parallels are present then, in terms of the necessary debates needed over the political program of Socialist Alt., their relationship to the Democrats, internal structure, and class orientation. The open discussion and debate within Socialist Alt. on the direct support for Bernie Sanders is a healthy sign of a continuing revolutionary tendency within the organization. As former members of Socialist Alt., or of its predecessor (Labor Militant), we would like to contribute to this important discussion. The recent departure of the New Orleans branch from Socialist Alt indicates what could happen in branches across the country. However that may be a best case scenario, given the continued activity of the group as the Louisiana Socialist Network. Unfortunately, generations of radicalized individuals have gone through a process of disenchantment with revolutionary politics, burnt-out by bureaucratic methods and dead-end strategies. What this letter intends, is to initiate a discussion on the numerous missteps of Socialist Alternative, and to raise the idea that these are not various errors, but are tied to a common logic. This letter does not agitate for anybody to break from Socialist Alternative, although a break from a fundamentally wrong methodology is concretely posed by the very contradictions in that organization. As the comrades were spot-on in raising in the members bulletins, the #Movement4Bernie campaign was birthed via bureaucracy. However while the leadership promise local discussion, the public image of the organization has, and will continue to be altered. The enclosing of debate within channels acceptable and controllable by leadership is cowardly and stands in contrast to the traditions of revolutionary Marxism, defined by the Bolsheviks as open debate (competing newspapers, long-term factions), and regular – not slate – elections. Political errors such as this, committed by a leadership eager to opportunistically capitalize on the possibility of new ranks of membership to correct a dire financial situation, are reinforced by system whereby membership are made unable to put the leadership in check when they find themselves distanced from the reality the rank-and-file engage in on the daily. Only after pressure from a minority of members was a fourth item, regarding the housing crisis in Seattle, added to this list, but with no concrete steps detailed. What this reveals is the battle that must happen in every branch for resources between organizing for Sanders, and organizing for the working-class. Given the recent re-election of Kshama Sawant on the basis of a campaign run on fighting the skyrocketing rents across Seattle, it is shameful for someone who prides herself as not “actually” being a politician to be exactly like any other in this instance. To campaign on an issue, then ignore it in office – this is a political disgrace which lays at the feet of the leadership. A “Peoples’ Assembly,” further detailed below, was brought together in February of this year. This conference, dominated by Democratic Party politicians, underpinned the political concessions Socialist Alt. had made. Whereas previously they had campaigned on firstly city-wide rent control, then linkage fees (a form of property tax on construction), and lastly public housing, the Assembly made not even a mention of public housing in it’s run up. Last minute the topic of the Assembly was focused specifically on the crisis of homelessness in Seattle, and the solution Socialist Alt pushed for was a large increase in temporary shelter beds. It is greatly positive that seeking to expand public housing may now be an undertaking of the organization. However if the intention is simply to wage a propaganda battle or confine it in City Council channels, which will limit the gains greatly with limited struggle by ordinary Seattle workers, then that is hardly a campaign nor a victory. Nothing less than a “15 Now for democratically-run Public Housing” can be the rallying cry for socialists. When socialist Kshama Sawant was elected to the Seattle City Council in 2013, this gave Socialist Alt increased prominence and increased importance not only in the socialist movement in the US, but also to a small extent within the wider workers movement itself. It presented serious opportunities. But as is always the case, with every opportunity comes dangers and mistakes. While we think that some serious mistakes were made, we emphasize that Kshama Sawant’s election was a significant victory for the cause of socialism. Union members were reporting that her campaign had made it easier to raise the issue of socialism in their unions and that her victory had somewhat raised the fighting spirit of the members. It also helped focus attention on the demand for a $15/hour minimum wage. Likewise, the Bernie Sanders election campaign has undeniably opened up potential opportunities for revolutionaries to engage in a politically thinking section of workers and oppressed populations in a principled manner. However balance should be given, and has been by comrades in the MB, in acknowledging the co-optionary and conservatizing elements of the campaign as well. Politics is unforgiving, and mistakes, if uncorrected, have a way of multiplying. When Kshama was first elected, it seems that there was a lack of complete clarity on her role and relationship with the other city council members. On the one hand, she frequently warned about the dangers of a sellout, which is always important to be aware of. However, there was also some confusion from the start. She talked about the “Democratic party elite” rather than the Democratic Party as a whole. Philip Locker talked about having a “friendly” relationship with “her colleagues” on the city council. From the initial City Council election campaign, language referencing race as well as an explicit working-class orientation were removed from draft forms of the campaign plan. In other words, it was not totally clear to them right from the start that the entire Democratic Party represents the enemy class, or even on what class they would base the campaign on. This doesn’t mean that every minute has to be filled with shouting and open warfare, but through the leadership’s refusal to have a clear class-based approach, an increasing reliance on a section of the Democratic Party has been substituted for working-class militancy, which instead Socialist Alt distances itself from. The lack of clarity in relationship to the entire Democratic Party coincided with a similar confusion regarding the union leadership: There is a good reason that members’ alienation and anger towards that leadership has never been greater in over a half century. The entire leadership, including the “progressive” wing of it, is firmly locked into the position that they must help “their” employers compete with the non-unionized employers. That can only mean one thing: helping further thrust their members into competition with non-union workers for who can work cheaper. This violates the very reason for building a union, which is to help eliminate that exact competition, and the result is concessions on top of concessions, refusal to really enforce contracts, and outright repression of those members who dare to raise their heads above the parapet and demand a real struggle with the employers. This repression includes many measures, including colluding with the employers to discipline and even fire such “rebellious” members. Ironically, some of the so-called “progressive” union leaders at the national level – like Mary Kay Henry of the SEIU – are some of the worst when it comes to simple trade unionism. While some local leaders may claim to be “independent” and to oppose some of the policies of their internationals, it’s not possible to really do so without organizing the rank and file to build a base of members who are active and conscious and committed to fighting around these issues. Without this, all such “opposition” is merely talk and collapses the first time it is put to the test. The failure to appreciate this fundamental principle of union activity became a major stumbling block for S. Alternative and for Kshama Sawant at the April, 2014 nation-wide “15 Now” conference. There, the leadership of the Hotel Employees and Restaurant Employees (UNITE-HERE) union, came to the S. Alt. leadership with the demand that they accept a “collective bargaining opt-out” (CBO) for the hotel industry. In other words, non-union hotels would have to pay $15/hour but unionized hotels would be excluded from that requirement. The excuse given was that, in effect, the movement could not force unionized employers to pay a minimum wage of $15/hour and pay benefits too. The real reason was that they want to convince the employers that they will save money by signing a union contract. Directly linked to the refusal of the leadership to “Fight for 15 Now” plus full benefits is their absolute terror at the very thought of a real, mass mobilization of workers and youth, one similar to the famous example set in Seattle in the 1999 protests against the World Trade Organization (WTO). It may sound overly harsh or simplistic, but the acceptance of the union leadership’s insistence on this point has to be seen as nothing but the first step to outright acceptance of their violation of the very principles of unionism. This failure was followed by S. Alt’s. refusal to even consider launching a campaign among low wage union workers such as grocery store clerks to help them organize to demand that their union back 15 Now in Seattle and to try to use such a campaign to organize for a real, fighting UFCW in general. Then, over a year later, S. Alt. did worse than turn their back on 15 Now Tacoma, which was the only 15 Now group that took the slogan seriously and actually fought for an immediate $15/hr minimum wage: Not only did they isolate 15 Now Tacoma from 15 Now, nationally; when the King County Labor Council was getting ready to vote to endorse 15 Now Tacoma’s ballot initiative, Socialist Alternative members actively canvassed the council delegates to vote against endorsement! Despite all the excuses, the real reason was, once again, that they didn’t want to run afoul of the union leaderships there whose position was expressed by one of them as being that they “preferred to work with the business community.” The fact that the tiny forces of 15 Now Tacoma ended up winning something (a 26% increase in the minimum wage for all over two years) that was close to as much as what was won in Seattle was ignored by the comrades in Seattle. The inevitable longer-term result has been that Socialist Alternative has more or less dropped the fight for a $15/hour minimum wage now, in favor of the union leadership’s “fight for fifteen” at some time in the future. An even more serious consequence has been that the enthusiasm that the election of a socialist to city council has largely collapsed among low wage workers. A member of SEIU Local 6 reports, for example, that among fellow janitors, whereas before several members were extremely enthusiastic about Sawant, within a year or so that enthusiasm had been replaced by distrust at best, partly because Kshama has made common cause with the dictatorial and hated president of the local. This desire to keep the links with the liberal Democrats in particular caused the Socialist Alternative leadership to hold at arms’ length any sort of movement of mass defiance, for example in the early days of the Black Lives Matter movement. While nationally playing up language around criticizing Jesse Jackson and Al Sharpton, on the ground in Seattle, instead of trying to link up with the radicalized black youth, the Socialist Alternative leadership orientated towards the NAACP and the (conservative) black ministers. 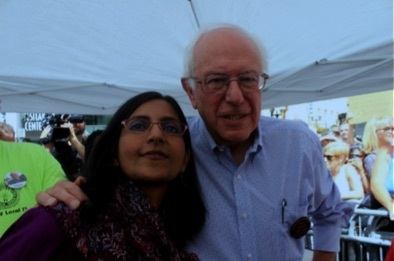 This mistaken approach then went further and was a warning of the future support for Sanders when Kshama gave an implicit endorsement of liberal Democrat Larry Gossett in February, 2015. In April, a number of Democrats were supported by Kshama to fill a vacant City Council seat, including a former NAACP and Urban League leader. Recently in February of this year, a “Peoples’ Assembly” was convened with absolutely zero time given for working-class participation from the floor. Instead six elected Democrats were supported and given an uncritical platform to give speeches. While the case of Socialist Alt openly supporting five Democratic candidates for Seattle City Council in October of 2015 is well known, what isn’t known is the depths to which the leadership fell. The South Seattle District 2 seat was contested in the primary by three individuals, Democrat incumbent (and winner) Bruce Harrell, Democrat Tammy Morales, and independent Josh Farris. Like Kshama, Farris was also known for his activist credentials, coming out of the Occupy movement leading an anti-foreclosure organization. His campaign openly supported Kshama, and referenced it in pledging to only take the average workers’ wage. His campaign was completely ignored, with the exception of a passing mention alongside the name of Morales, in a list of candidates who supported a housing platform Kshama put forward. Come October, only the campaign of Morales was highlighted by Socialist Alt. All other politics in that instance was subsumed under the single qualification of a toothless support for a platform which Kshama herself is no longer is acting on. It is in this context that the quivering criticism towards Sanders exists, where a front group could form whose website lists not a single criticism of Sanders. In the wake of this sharp turn towards the Democratic Party, it is unsurprising, though still shocking, to read of an attempted rewriting of history, where now the leadership is beginning to claim past mistakes in not supporting the potential Democratic Chicago campaign of Karen Lewis, or endorsing MXGM member and Mayor Chokwe Lumumba. Certainly Socialist Alt has been knee-jerk sectarian to the politics of Black self-determination, and is ignorant of potential developments in Jackson, Mississippi. However the central crime certainly was not caving to support a Democratic election campaign. The historical alterations continue back to the 1980’s on the campaign of Jesse Jackson, where the leadership’s comments are completely erroneous. Labor Militant (the predecessor to Socialist Alternative) never had any consideration of calling for a vote for Jackson. Rather, LM initially called on Jackson to break from the Democrats and lead a movement for a mass labor party/workers’ party. The leading body of the CWI (Committee for a Workers International) criticized this by pointing out that it was a mistake to call on a capitalist politician to lead the workers’ movement. After discussion within Labor Militant, agreement was reached and the position was changed. Perhaps most shocking is their revisionist recounting of the position of the Bolsheviks regarding the Mensheviks. They compare the position of the Bolsheviks “call(ing) on the Mensheviks to take power” to the support for Sanders. The one has nothing to do with the other. The former amounted to a call on a social democratic party to overthrow the capitalist state by taking power through the workers’ councils; the latter is support for an out-and-out capitalist politician. It is hard to believe that the leading comrades in the organization don’t see the principled difference here. Break from the liberal wing of the Democrats! Use the position of Kshama Sawant to organize to build a mass movement of defiance from below. Power must come from the working-class, not from career politicians, no matter how “progressive,” nor from top-down NGOs. Withdraw support for liberal Democrat Bernie Sanders. Not supporting Sanders in no way means not trying to relate to the Sanders supporters. Break from the union leadership, which represents the bosses and the Democrats inside the workers’ movement. Their entire strategy has alienated the membership from their own unions and has proven to be a complete failure. Help the rank and file organize to take back their unions, to transform the unions into fighting organizations that defend and advance wages and working conditions rather than collaborate with the unionized employers and divide union workers from non-union workers. Put into action the call for 100 independent left candidates in the next election. Turn to the 1000s of individual local protest movements (around issues like police murders, lead in the drinking water, fracking, etc.) and encourage them to run independent left candidates with class-based grassroots campaigns at the local level as a first step towards coming together on the national level. We urge those comrades who oppose Socialist Alternative’s capitulation to a wing of Democratic Party politics to consider where this important mistake comes from, and to make the connection between it and the general approach of the Committee for a Workers International. Comrades formerly in CWI sections from England to Bolivia have written material on the deficient and centrist approach of the International towards the state and the dual tasks of building both a revolutionary party as well as a mass party. The errors made globally illuminate upon the mistaken logic in the United States of Socialist Alternative. Neither staying in, nor leaving, the CWI makes one more or less a Marxist – rather it is the positions and principles upheld, and the methodology utilized. Utmost importance is chiefly on the identification of oneself as a Marxist and as a revolutionary above whatever party affiliation. In the first place, even if he were an independent that would not mean he’s not a liberal. But in any case, he’s independent in name only. The fact is that he is reliant on the Democratic Party for his reelections, since he has a deal with them that they won’t run a candidate against him and he will support their other candidates; his top staff is composed almost entirely of Democratic Party operatives; and his “Our Revolution” is dedicated to supporting a whole stable of Democrats, including the anti-Muslim bigot and war hawk Tulsi Gabbert. Most important of all, though, is that his program falls entirely within what is acceptable to the liberal wing of the Democratic Party.